Have you heard of MOOCS, crowd learning, maker culture and geo-learning? Do you know what they are and how they might impact on education? 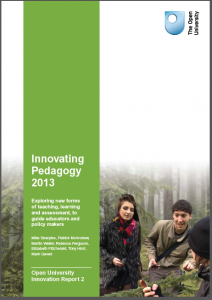 Innovating pedagogy 2013 is series of reports from the Open University UK that explores new forms of teaching, learning and assessment for an interactive world, in order to guide teachers and policy makers in productive innovation. The report proposes ten innovations that are already in currency but have not yet had a profound influence on education.